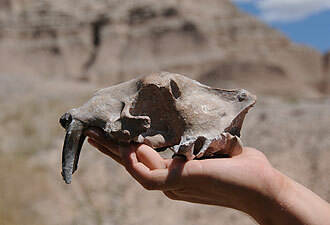 The saber tooth cat skull that Kylie discovered. The badlands terrain invites hikers to explore. Remember to be prepared when venturing into the park. NPS.gov homepage photo: Bighorn sheep are often spotted near the Pinnacles Overlook. You never know what you might find in Badlands National Park. Take the Ferguson family, for instance. Last summer seven-year-old Kylie Ferguson made an unlikely fossil discovery. The thumb-print sized white bone she spotted near the Ben Reifel Visitor Center turned out to be a saber tooth cat skull. Fossils are common in the Badlands, but a well-preserved saber tooth cat skull is exceptionally rare and scientifically significant. Most visitors enter the park at Big Badlands Overlook, accessible from exit 131 on Interstate 90, and are greeted with stunning scenery of jagged peaks and deeply eroded sedimentary rock formations. The Badlands Loop Road continues for 30 miles and loops back to I-90 at exit 110 in Wall, SD. Along the way there are 11 overlooks and three trailheads. No visit would be complete without a stop at the Ben Reifel Visitor Center. Wander through exhibits that feature life-size ancient animals from the Golden Age of Mammals (37 to 25 million years ago). Rangers are standing by to help you plan the rest of your trip. Hiking, wildlife viewing, and camping are just a few of the activities to enjoy. 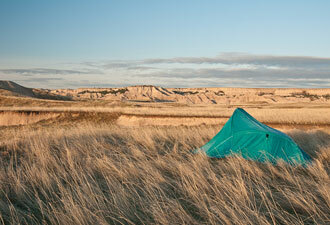 To experience a prairie wilderness, plan a cruise along the Sage Creek Rim Road. This area of the park offers open vistas and is home to many animals including bison and bighorn sheep. Hikers could spend a whole day wandering around the Sage Creek Wilderness Area. There are no trails in the backcountry, so be sure to pick up a map at the visitor center. 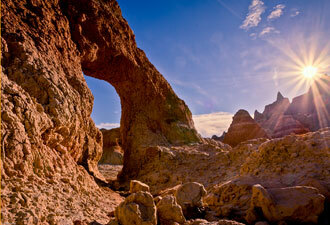 Even a short hike along one of the trails near the visitor center will draw you into the badlands landscape. Try the ¾-mile Door Trail where you will see the “baddest of the badlands.” Be sure to wear sun protection, closed-toe shoes, and carry plenty of drinking water. At the Junior Ranger Program children can earn a badge and practice the Junior Ranger motto: Explore! Learn! Protect! That's where our most famous junior ranger, Kylie Ferguson, learned all about fossils and made her fossil discovery. Ranger programs such as fossil talks, geology walks, and night sky programs, are available every day from late May to early September. Kylie did the right thing. She reported her fossil find to a park ranger. One thing led to another and, as it turned out, Kylie's fossil find was a significant scientific discovery. A rare saber tooth cat skull from the genus Hoplophenus is now preserved and protected for future generations as part of the Badlands museum collection. Plan a trip to the Badlands. It is the perfect place to enjoy time with your family, learn about yourself, and make discoveries. Even if your discovery doesn't shake up the scientific community, you can still create life-long memories to treasure. For Kylie and her family, her discovery at Badlands National Park will be remembered forever.